This is a subversive little movie. 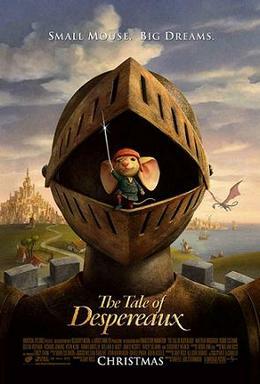 Everyone in it is fighting the power: Despereaux is a small mouse with big ears who refuses to be meek like all the other mice. Roscuro is a shipwrecked rat who mostly refuses to be evil, like all the other rats. And there is also a soup chef who refuses to abstain from cooking soup. I enjoyed it, even if it’s message seemed a little heavy handed at times. I saw it with Holly and the kids during our trip to California. Holly, who writes Children’s literature, came away disappointed. Apparently the book is much darker and better (it won the Newbery medal in 2004) than the movie. Aaron, who also read the book, seemed pretty blasé about the whole thing. I have been amused at Aaron’s reaction because there is talk on the Web that the movie’s G rating was inappropriate for its dark story. I didn’t share this opinion, but up until now Aaron has always been our bellwether of frightening movies. Kennedy, who hadn’t read the book and was incredibly interested in seeing the movie, just about fell to pieces because her mother and brother were already comparing and contrasting the movie with the book as the credits rolled.